How difficult is it to select “just the right color” when planning your project? Color, and the combination of colors, all convey different meanings and messages when used in design. The process to select the perfect color for your project can be daunting. If the wrong color is selected, the project can fail, or even worse, be seen as inappropriate or an insult. Here’s a few tips to follow when selecting colors. 1.) Know your audience. Who is viewing the final product? Are they male or female? What is the age group of the audience – Young children, teens, young adults, adults, baby-boomers or seniors? What is the area of designation – purely informational, business, medical, artistic, technical, entertainment, or just for fun? Certain colors apply to certain demographics. For example, teens are influenced by vibrant colors, while corporate tones of dark blues and browns are reserved for more subtle applications. 2.) Inspiration. Are there elements that inspire the project? What colors encompass these elements? If the project is inspired by nature, then greens, browns and blues are appropriate. If the project is inspired by a photograph or a piece of art, use the key colors in the image as the color base in the project. When the project is inspired by a particular country or culture, use the colors appropriate, such as red, white and green for Italian inspirations, or blues and tans for English inspirations. 3.) Logos. Does the project include a pre-existing logo? This will often dictate the colors of the project. The company logo should be recognizable and not masked or hidden due to other objects on the page. Colors should complement the logo, not fight with it. 4.) Your message – Too few vs. too many colors. There are instances when one or two colors are too few and do not convey the message of the project. But there are also times when a project that has 10 colors involved looks like chaos and a mess on the page. Color should reflect the message the project is trying to convey. For example, if the project is serious in tone, a rainbow color palette of seven colors would not be appropriate. If the project is for a funeral home, do you want bright pinks, hot orange and neon greens? If the message is fun and festive, would black or brown be appropriate? Know the message your project is trying to convey, and choose colors appropriate to that message. Black– Often considered the color of mourning or rebellion, yet can convey elegance, sophistication and even a touch of mystery. Black can make other colors appear brighter, or can look visually slimming. White — Purity, cleanliness, innocence, softness, brightness and brilliance are all perceptions of White. White symbolizes weddings, and is prominent in medical fields. Winter and angels are depicted with white. White is considered a neutral color, and can make other colors stand out when used in combination. Red — Vibrance, hot, passion, love, violence, war, blood, anger are all aspects of the color Red. Red is a powerful color, and considered important (ie: Red Carpet at awards shows). Red also notes emergencies, and danger looming and is used to get your attention in these instances – this is why it is the color used for firetrucks and stop signs. In Eastern cultures, Red denotes happiness, prosperity and purity, and even is noted for good luck. Purple — Royal, warm yet cool, noble, spiritual, satisfaction, creativity, intrigue. Purple is derived from mixing the hotness of reds and the coolness of blues, and is noted for prominence at both ends of the emotional spectrum. It is the color of mourning in Thailand, yet is associated with royalty in many countries. Green — Nature, life, renewal, environment, abundance, envy, jealousy. All are associated with the color green. Green can be a restful color as it has tones of blues, or it can be strong and bold, such as the shade used as the national color of Ireland. It’s reminiscent of all seasons – based on its shade. Spring – bright green, Summer – warm green, Fall – deep forest green, Winter – holiday greens (pine, evergreen shades). With its intricate shadings, Green can denote balance, harmony freshness and stability. Blue — Blue is the most popular color – and is a favorite of both men and women. Shades of blue denote different connotations. Blue can be calming, strong, old-fashioned, bold and light, easy, fresh and natural. It is often considered the color of peace, and associated with unity, stability and confidence. It is used in many corporate logos, is a prominent color in both the medical and legal fields, and associated with the military. Yellow — Warmth, nature, sunshine, fruitiness, happiness and cheer yet cowardice and deceit, are all perceptions of Yellow. Yellow is often used on hazard signs and in other instances that need to “stand out” as it is highly visible and vibrant. It is a sign of hope when used to welcome soldiers home. Yellow is the color of mourning in Egypt, yet represents courage and peace in Japan. 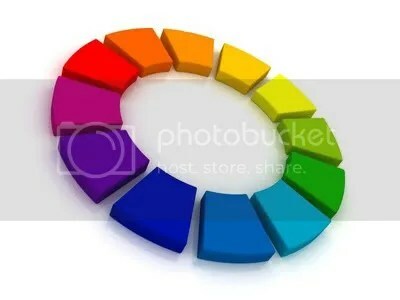 When choosing the colors for your project, be sure to consult a color wheel first, to determine color relationships. See what colors are adjacent to each other (harmonizing) and which colors are across from each other (complementing). Colors that clash or are considered contrasting are colors separated by harmonizing or complementing colors on the wheel. The further apart, the higher the contrast. There have been books written in extreme detail about colors, their perceptions and meanings. Hopefully this brief overview helps in how you choose your colors when beginning each project.